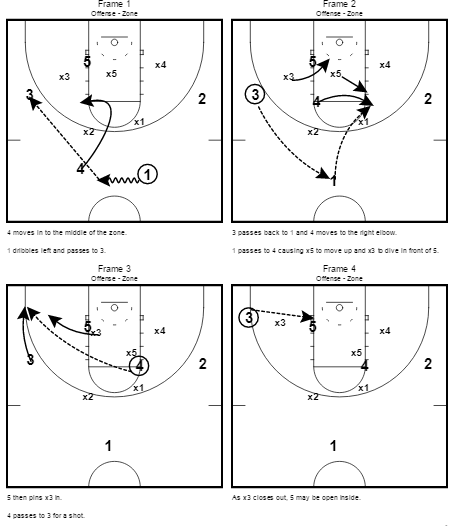 Below are two zone set plays from Florida Gulf Coast Head Coach Joe Dooley. Dooley has been the head coach at FGCU since 2013, winning 20+ games in all three years. Dooley also has been the head coach at East Carolina, where he won 57 games in four seasons leading the Pirates. Dooley played at George Washington in the 1980’s and then started coaching as an assistant at South Carolina and East Carolina before becoming East Carolina’s head coach in 1995. After leaving ECU, he was an assistant at New Mexico, Wyoming, and Kansas from 1999-2013. He was an assistant for Bill Self’s 2008 NCAA National Championship team. Against a 2-3 defense, 1 dribbles towards 4. On the dribble, 4 cuts into the middle of the floor to the left elbow. 1 passes to 3 to get the defense to move, then 3 passes back to 1. 4 moves to the high post on the right side trying to force x5 to step up. If he does, x3 will step in front of 5 to guard the post. If the ball can go into 4, he looks to skip to 3 in the corner on the left side. 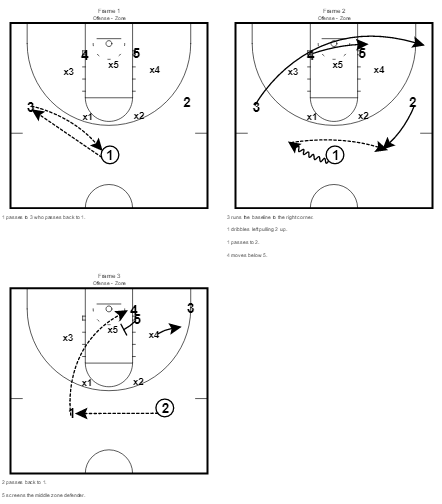 x3 will have to recover out to the corner leaving 5 open in the post. 1 passes to 3 who passes back to 1. On the pass back, 3 runs to the right corner and 4 moves to the right block underneath 5. The run creates an overload on the right side of the floor. 1 passes to 2 then gets it back. As 2 is passing back to 1, 5 screens in on x5 and 1 throws the ball over the defense and lobs it to 4. The point of this play is to get x3 to not guard anyone leaving x5 and x4 to guard 3 players.